I love the smell of laundry that has dried in the fresh air and sun. Growing up, we lived in the country. Laundry was my chore, and to be honest I secretly loved doing it. The smell of dryer sheets still make me happy. Anyway, once April rolled around, I was stricktly forbidden to use the dryer. It was "the sun is free and we have to pay for gas" school of thought that my mother drilled into me. Now, as an adult with my own home, I totally understand. I love to pinch a penny now and then. It frees up more cash for my "junking" excursions, right?! Do you "hang" your clothes to dry in the summer or still use the dryer? I would love to hear your opinion. I am afraid my neighbors would hate it...I don't live in a 'clothesline' neighborhood. Then again, it is also not a "paint furniture in your driveway" or a "run your palm sander at 10pm" kind of neighborhood either, but I have yet to have a knock on my door with complaints. Ha! So should I throw caution to the wind and do something as crazy as installing a clothesline in my backyard? Or would that give me the "hillbilly" label I have heard a neighbor or two mention? Oh, and I should clarify, I would never hang bras, undies or my hubbys boxers out to dry, just so ya know! Personally, I think they are pretty darn cute. Lets hear it girls, and don't hold back! I hang mine out all summer...love doing it, love how it looks, love the smell! My Mom always used a clothesline in the summer, and I've always wanted to put one in at our house, however today we would be chasing the clothes all over the yard, much too windy! I've nominated you for the Sunshine Award at my blog, so stop on over to claim it! Hope it brightens up your day! I grew up in a small town with a big backyard, so hanging the laundry was the norm. Now, I would love to, but like you - I don't know if I could get away with it! My mom always hung out clothes. (We didn't have a dryer.) In the winter they froze stiff. In the summer some times birds pooped on the clean clothes and they had to be rewashed. UGH!! We went to Amish country in Pennsylvania a few years ago. Clothes lines every where. So charming! I don't live in a clothes line neighborhood either. Such snobs now days. Love the post. I know ~ I was just thinking about that very thing a couple days ago! I really want to install one....I think you should go for it as well! I love the smell of sun dried laundry & I heard it makes whites 'whiter' than anything else! There is NOTHING better than the smell of sheets just off the line. I used to wash all my clothes each season change and hang them on the line. After that, just t-shirts. My neighborhood prohibits them. Crazy people. I say do it. People will be jealous. ahh, if you want fresh smellin linens, ya gotta have the line! hubby & i are pretty simple, we rig a cotton line from tree to tree..just continue pulling/wrapping prior to your tie..keep in mind the line will need periodic tightening and it's an easy change when the line wears out. we say go for it..Enjoy! I too had one until last summer...hubby took it down to redo the side of the house....I should get him on it to put it back up....i just do not like towels done on the line as they are too crispy. But the smell is like no other! Umm, yes, clothes on the line, in the summer breeze. I love the smell and feel of clothes ‘hung out’. And I really like the idea of the savings of not running the dryer I just moved into a new-to-me house. One of my first purchases was an outdoor clothesline. I got the umbrella type. It will be easy for me to install, just pvc pipe in the ground for a sleeve, and you can drop the umbrella clothesline in. Then, remove it when not in use, or cutting grass, or for the winter. (Your neighbors might not object too much to one that isn’t so permanent) And who knows, you may start a trend. Perhaps other neighbors are thinking the same thing as you! Just a thought- I think that clotheslines (especially the umbrella type) are a seasonal item for many stores. Now is probably a good time to get one. My grandma (the one with your house) had one of those square top clothes line poles in her suburban backyard. So, I think you should go for it! I live in the high desert...where there is too much dust for outdoor drying....and too many bugs! I don't do it, but I wouldn't be against it either. I'm so glad that you wrote about this. One of my memories of my grandmother is doing this very thing. I didn't realize the money aspect of it at the time, but I just liked to watch the sheets in the wind. hmm, my dog would eat the clothes, well not eat the clothes but roll in them once he was able to get it off the line...then they would be strewn around the yard and dragged through the sandbox, you get the idea, so uhm, nope no clothes line for me...but I say go for it, it is in the backyard not the front and maybe some of your neighbors would take heed and do it themselves! :) It does look pretty darn cute too! Clothes dried on the line are the best. Yes, dryer sheets help, but not like the outside air. I must vote for the clothes line. I love to tap into my inner hillbilly. Especially when it comes to line drying. Besides the awesome freshness that only a breeze and sunshine can impart, line drying sustains the durability of fabrics as well. I used to have a clothesline that my hubby made at our old house. Kinda got some complaints with the stiff towels and jeans. Got out of the habit but still hang up items on a wooden clothes hanger thingamabob inside the house. We must live in drastically different areas as people tend to think you're weird if you DON'T have a line in your back yard. I say, if you don't care about that other stuff, then who cares about a line? Save some money and save the planet! My problem is that I am too darn lazy to walk the clothes outside. I do love the smell and feel of sun dried sheets though. Um, if you read my Homestory blog, you know I am all over the clothes line. I do hang socks out- the sun whitens them up- but not undies. We like them softer. There are only a couple of us with clotheslines in this HISTORIC neighborhood...and I am keeping mine! Hi Mary, I can't imagine NOT hanging out the washing. Just don't become OCD like a friend of mine who has to use matching colour pegs for the clothes he hangs out...I bought him multi colour stripe boxer shorts once just to confuse him! Yes!!!! Hang em up:) We have an old clothes line, but we need to get it set up. I would love to have my clothes blowing in the wind! Just do it...you might start a new trend in the neighborhood. Call it eco-friendly! As long as the temp is above 50 my clothes and sheets go out on the line. It could be December and as long as it is warm enough out they go. I use to cring when I'd see peoples clothes outside and think why not just use your dryer. Once I learned the dryer zaps a lot of electricity(especially the amount of laundry i do)I started putting my clotes on the line. I refuse to do towels because I don't like the feel. Nothing like at the end of the day crawling into bed with the sent of outdoor laundered sheets. ps. 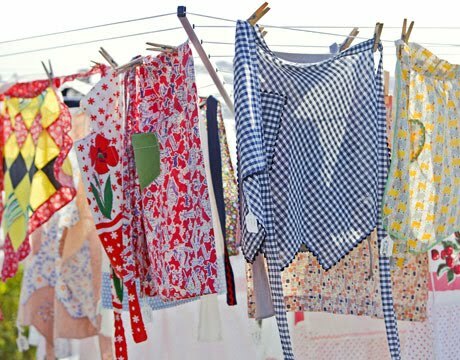 I cant believe that some neighbourhoods in the US ban clotheslines, wow! I bet if you did it, there would be a couple of others in your neighborhood who would also jump on the bandwagon. I say go for it!!! I grew up without a dryer, so I still really hate using my dryer, and don't unless absolutely necessary!! ( year round! )And I used a wringer washer for 20 yrs. so I REALLY enjoy doing laundry...with my washer! if you want to be a part of the fall sale, I would LOVE it! just let me know! I know that this is going to sound Funny to most of you, but I hope not! I think that there is just something soooo! ROMANTIC about white linens hanging out to dry on a clothes line. They just smell so crisp and for some reason they just smell so white...does white even smell, well you know what I mean? In any case I vote you go for it, tell everyone you live a cottage industry life :P (While sticking out your tongue) He he, ha, ha!! Visit me sometime for a little inspiration. Hi Mary- love the blog! Coming from australia it's almost laughed upon to have a dryer- although i must admit i did!! 3 kids justify's it j.u.s.t! I think?!?! Anyway now I'm living in the english countryside I am a dryer gal through & through- i just don't think there's any heat in that big ol' sun until about June!!! And a line in the garden that looks like that first one- with the little angel of a girl reaching up to help her ma- is almost a required addition to your yard- i'd sooo happily look over the fence at that!! Have a great weekend with your washing & sander! nothing like the smell of fresh air dried laundry!!! 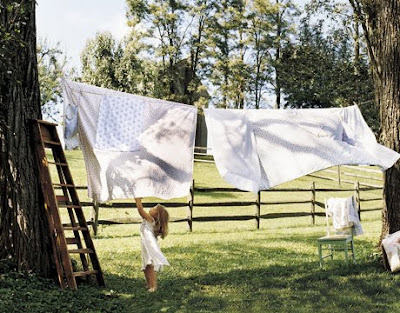 I love hanging laundry outside...but keep it to just sheets and kitchen linens...and pretty aprons too. I paint my furniture in my driveway. And I sand it in the driveway too. And I would put up a clothesline in my yard. As long as it is not the front yard, what should the neighbors care? Go for it, what will they say :) Tell them your saving on your gas and electric bill, they can't get mad. I love the smell of clean fresh sheets my hubby thinks I'm wierd because I change them every few days but there is nothing better then crawling into a nice fresh bed! One day I hadn't washed my bras in a VERY long time so I had about 10 of them and I hand washed them and then hung them outside in the sun. Of course that was the day my neighbor came over to borrow the lawn mower. He was impressed with my collection :) Funny! Wishing you a wonderful weekend! You didn't mention if you had a homeowner's association or if it just wasn't the "IN" thing for your neighborhood. But if either way, now might be a good time for someone to mention it to a few neighbors (best way to get that idea out there would be to hang some laundry out!) ...it only takes one person to start a revolution!